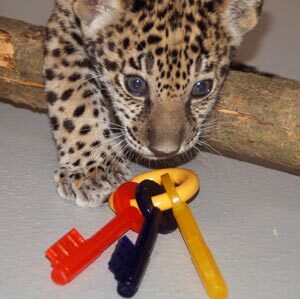 The Milwaukee County Zoo has announced the names chosen for its newest residents, two male jaguar cubs, who are now on public exhibit, at four months old. The announcement was made March 13 by Zoo Director Charles Wikenhauser, at the indoor jaguar display in the Florence Mila Borchert Big Cat Country. B’ alam was the winning name chosen through the Zoo’s public naming contest, sponsored by Jenkins Jaguar and Wisconsin Jaguars Ltd. auto club. Zean was chosen by schoolchildren in Belize, Central America. The schoolchildren were an integral part of the book, “Pat the Great Cat, A Jaguar’s Journey.” Pat is the father of the jaguar cubs; a rescued, wild-born animal from Belize. Together with Milwaukee-area schoolchildren, the Belize children co-authored the real-life story of Pat the cat, as part of SHARP Literacy Inc.
Zean encompasses the Belize people living and working together in Belize, with all cultures. This is a wonderful way to express the children’s hopes for the future. As jaguars roamed in North, Central and South America, the Belize children will more likely identify with a name like Zean. The Milwaukee County Zoo thanks all of the participants who submitted names for the contest. The Zoo received more than 1,300 names for the public contest, so it’s clear these jaguar cubs have become tremendously popular with visitors. 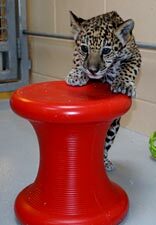 This is the first litter for mother Stella, and father, Pat, and marks the first jaguar cubs born at Zoo since 1975. The cubs were born November 13, 2012. Visitors can view the cubs on display daily from 10:30 a.m. to 4 p.m. They are in good health, and are quite active with their mother, and with each other – often running, jumping and pouncing in their exhibit.